Sir, In September 1990 the European Space Agency (ESA) started an Astronaut selection campaign in connection with its Hermes and Columbus programmes. There are to be two categories of Astronauts: the "Laboratory Specialist" and the "Spaceplane Specialist". 3. Mission Specialists on board the Spacelab preparatory flights during the Columbus initial phase. "Spaceplane Specialists" will be confirmed test pilots who will participate in the final study and in the qualification phases of the Hermes Spaceplane and will eventually be the Commanders and Pilots of the first space flights. The selection of future astronauts is made in two steps. As the first step, ESA requested its 13 member states to preselect 3 to 5 astronaut candidates for the end of April 1991. At the end of 1991, for the second step, ESA will select ten, i.e. 6 Laboratory Specialist and 4 Spaceplane Specialists, from among the sixty or so candidates. I went through the national preselection in Belgium. This was placed under the responsibility of the General Secretary of the Belgian Science Policy Office, who delegated this duty to a selection board of five experts (a Medical Doctor, a Scientist involved in manned spaceflight experimentation, a Psychologist, a Pilot and a linguistic specialist), assisted by a medical board of 3 Physicians from the Belgian Air Force. In the first step, the board eliminated candidates who were not in the suggested age range (27-37 years), or who did not have the requested educational background or professional qualifications, or who had a certain medical history. The second step consisted of an examination of the verbal and written comprehension and of the oral and written expression of international technical English. Criteria for the third step, the medical selection, were taken from the medical requirements laid down by ESA for the second level selection. The first part of the medical selection concerned disqualifying factors. Candidates had to fall within a certain range of values for the following standards: anthropomorphic (weight, height in standing and sitting positions, movement ranges,...), ophthalmological (visual acuity, refractive error, accommodative power, heterophoria, colour vision, depth perception), audiometry (hearing, tympanometry) and vestibular. In addition, the cardiovascular system was checked. Failure to meet the first two standards led to most of the rejections. Dr. V. Pletser works in ESTEC (European Space Research and Technology Centre of ESA) where he organises parabolic flight campaigns for scientific experiments in microgravity; he flew more than 900 parabolas on board the NASA KC-135 and the CNES Caravelle aircrafts as experiment operator; he is shown in the photo with an experiment apparatus on board the KC-135. The second part of the medical examination was twofold. Firstly, an in-depth clinical examination was conducted, including complementary ophthalmological and audiometry tests, electrocardiogram, heart echography, X-rays, blood and urine tests, electroencephalogram, stomatological examination and pulmonary function tests. Secondly, physical tests included treadmill exercise stress tests with the monitoring of cardiac and respiratory outputs, and a vestibular Coriolis stress test consisting in vertical movements of the upper body while sitting on a chair rotating at two different speeds and in either direction for a total of 10 minutes. This test contributed to the elimination of a large number of candidates, even among confirmed pilots. In the third part, psychological profiles were screened by projective testing, questionnaires, interviews and group tests to verify such matters as aptitude of working within a group or under conditions of stress. Candidate psychometric aptitudes were evaluated with respect to reaction times, performance of various types of memory, ability to perform multi-task operations, manipulative skills, etc. Simple paper pencil tests were used, along with special instruments used usually for rating fighter pilot performances (e.g. flight simulators). Special medical and physical tests consisted of centrifuge tests and of lower body negative pressure tests. Two centrifuge profiles were applied: a run at 8g for 1 minute in a lying position (antero-posterior: +gx) and a second run at 5g for 45 seconds in a sitting position (up-down: +gz). For both runs, the rate of onset was 0.3 g/s. 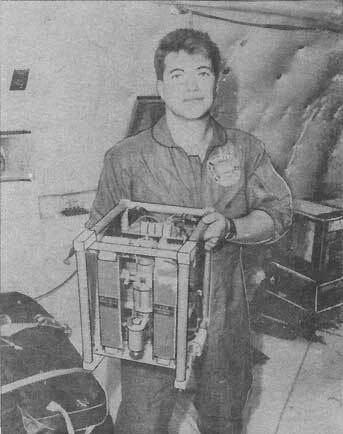 For the other test, the lower body part was placed in a cylinder, depressurized for 45 minutes following a predefined profile, causing the blood to accumulate in the legs. This test was aimed at verifying the ability of the cardiovascular system to react to such conditions within specified limits. At all times, the candidates were monitored for heart functions and blood pressure. Test termination could have been made either remotely by monitoring physicians or by the candidate, himself, activating a kind of "dead man" device. These tests were important and assess that the physical constraints of lift-off and of an orbital stay could be endured. The five Belgian candidates, one woman and four men, were presented at the beginning of May in Brussels. The female candidate is a Medical Doctor and a professional airline pilot. The four male candidates were (1) a fighter pilot who is also an Engineer in Electronics, (2) an Engineer in Mechanics holding also a Masters degree in Physics and a PhD degree in Astronomy, (3) an Engineer in Geology and (4) an Engineer in Electronics. The author of this text, who is also a BIS Member, has the honour to be one of them. The second selection phase, at European level, started at the beginning of May and involves about sixty candidates of the 13 member states of ESA. The first interviews and psychological tests will take place in June and July 1991. Medical examinations will follow in September and October. A second series of interviews will be conducted in November and the ESA General Director will designate the 10 European Astronauts by the end of December 1991.